This scenario is loosely based on several real actions which were fought between the US 173rd Airborne Brigade (“The Herd”) and North Vietnamese NVA regulars in the Central Highlands during 1967. The scenario was designed to try out two ideas. The first was to test out Incoming! – a set of Vietnam modifications I have written to use with the excellent World War 2 Crossfire wargame rules by Arty Conliffe. The second was to attempt to differentiate between the US and NVA abilities to communicate (i.e. the US players could react to changing circumstances by the use of rapid radio communications whereas the NVA were forced to rely on a set of orders issued prior to the battle and could only change these orders by the personal intervention of senior commanders). Although designed for the free flowing Crossfire system the scenario can probably be played with any company-battalion level set of rules with a few suitable modifications. This scenario is too large for a set of low level platoon sized skirmish rules however. In late 1967 the 173rd Airborne Brigade was tasked with conducting Search and Destroy operations in the Dak To province of the Central Highlands of South Vietnam. 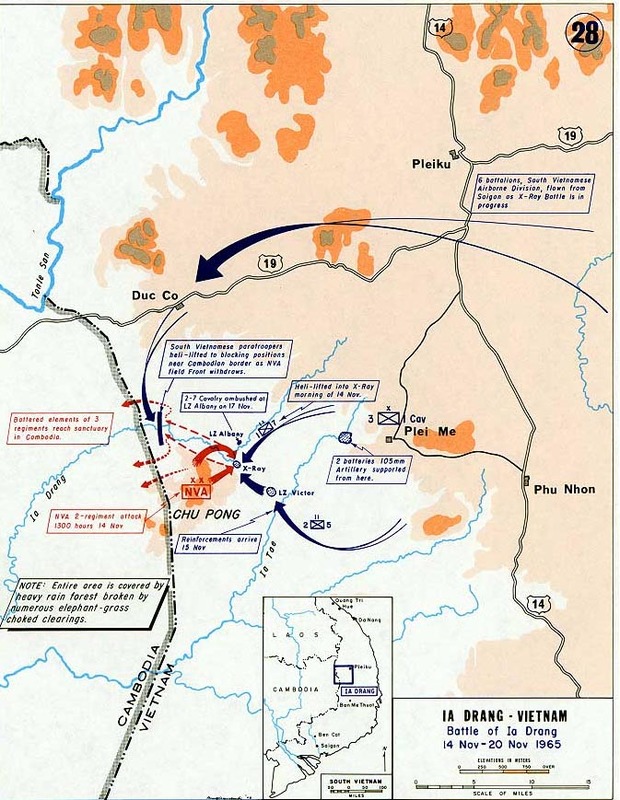 Operation GREELEY was one of these operations and the game represents a hypothetical clash between the US airborne troops and the 174th NVA Regiment. This scenario is best played with an umpire to oversee the hidden movement and to ensure that the NVA players follow their orders. The players should also be unaware of the scenario details so that neither side is really aware of what they are up against. Umpires should make the most of this fact to play on the player’s fears of what is happening to increase the levels of uncertainty. As a result of information gained from Special Forces, LRRP’s and captured POWs the 4th Battalion 503rd Infantry has been tasked with carrying out a Search and Destroy mission around Hill 731, which is believed to be an NVA base area. The first phase of the mission is to insert into an LZ and search and secure Hill 731 itself. Owing to the difficult terrain (steep hills covered with jungle) the infantry can only air assault into the area via a small clearing close to a river south east of Hill 731. The US player takes on the role of Company A commander. Company A, 4/503rd Infantry is to air assault into the clearing (nicknamed LZ Tusk), and to secure the LZ before moving out and clearing Hill 731. Once the high ground is declared clear, additional troops will airlift in and the LZ will be expanded for further operations. The air assault began at 0730 hours and is complete by 0930. The game starts with company A deployed in the LZ and ready to move out. The time is now 1000 hours. In addition an FAC (call-sign Blackjack 3) will be on call during daylight hours. Air and artillery support may be requested in addition to the use of on table mortars. 1. Due to the proven fighting ability of the 173rd troopers all US troops are rated as Veteran. 2. The LZ can hold a maximum of two helicopters at any time. The NVA player assumes the role of a battalion commander from the 174th NVA Regiment. Late yesterday afternoon your battalion HQ received reports that US troops were due to air assault into your AO near Hill 731. As the information came from a usually reliable source two of your companies were warned off for offensive operations, moving onto hill 731 during the night. The likelihood of US activity was confirmed by the air and artillery preparation of a clearing for use as an LZ close to a river south east of hill 731 this morning. At 0730 hours American helicopters began landing troops into the clearing, although it is obvious that the small size of the clearing will hamper US attempts to land large numbers of troops. Your scouts report that only 2 or 3 helicopters can enter the clearing at any one time. Fortunately the high ground had been prepared earlier for defensive operations and a number of bunkers were available for immediate occupation. You have time to issue your orders and by 0930 hours your leading troops are setting off to assault the enemy. The game will start at 1000 hours. To destroy the American soldiers, and to prevent further enemy landings in the vicinity of Hill 731. However, it is expected that US retaliation will be prolonged and heavy once they get over the initial shock of contact. You must inflict as much damage upon the enemy as possible but you must also ensure that your troops are clear of the area by first light (0530 hours) on the following morning. One platoon plus 4 snipers may deploy on Hill 731. These may be deployed in pre-positioned bunkers. The location of the bunkers and snipers (and their facing or fields of fire) must be clearly marked on a map before the start of play. All other NVA units deploy onto the table from the north and west edges of the table in accordance with a pre-arranged plan of attack (see map for north direction). To simulate the NVA command structure, pre-battle preparation and the difficulties of operating in dense jungle the NVA player must prepare a battle plan prior to starting the attack. The player may examine the playing table prior to the start of the game (but without the US troops deployed) to simulate earlier reconnaissance. Company HQs are visited by the Battalion HQ to change their orders. A change of orders is automatic when the two bases are physically touching each other. Platoons are contacted, either by their battalion or own company HQs (runners may be used between company HQs and platoons). A change of orders is automatic when the two bases are physically touching each other. Any change of orders for an NVA unit must be drawn on the map or written down. Due to the sound training and high levels of motivation and leadership shown by the NVA at this time all NVA troops are rated as Veteran. In addition your troops are rested and confident of their ability to engage the enemy on their own ground. The game is deemed to commence at 1000 hours (10 o’clock for the seniorNCOs and, for the Officers, “the big hand is pointing to the twelve, while the little hand is pointing to the ten”!). If the action continues through the night then use the night fighting rules from the “Hit the Dirt” Crossfire supplement or use the rules for whatever system you are using. This scenario was designed to use the moving clock system detailed in the Crossfire scenario supplement “Hit the Dirt”. If using this system at the end of each US turn throw 1D6. The time will advance by 30 minutes on a score of 5 or 6. The playing area should be laid out as shown in the sketch below (I originally set the playing area up on a 6 foot square table). The terrain is dense jungle covering two steep hills. The LZ and stream are on the only relatively flat part of the terrain. The hillsides are dotted with rocky outcrops. The LZ itself is open terrain but the area surrounding the LZ may be dotted with bomb craters from the preparatory air strikes. If using the Crossfire rules the jungle is made up of a LOT of areas of dense vegetation with small gaps between then. Fields of View/Line of Sight for the troops should rarely be more than 6-8 inches in a straight line. The exception is the LZ which should be about 12 inches across. The stream is assumed to be heavily overgrown, which prevents observation along it, but the sand/gravel stream bed is reasonably good going if either player wishes to use the stream as a trail! The crucial aspect of this scenario is that the opposing sides have different ideas of what they are trying to achieve – the US player must think that this is just another S ‘n’ D mission in the jungle and should not anticipate anything more than finding a few enemy troops and a bunker or two as a rearguard while the rest of the enemy didi out of the area. The NVA player however knows that he must attack but not what he is attacking! The umpire must ensure that the players follow their briefs – if either side correctly guesses what his opponents are up to then it is a bonus! Hidden movement by both sides must be enforced by the umpire until contact is made with the enemy then the usual visibility and spotting rules apply. A good umpire will be able to use his imagination to keep up the pace of the game and to increase the tension. The umpire must also take care to enforce the NVA player’s orders and direction of attack. Although this might seem to be a disadvantage when compared to the US communications and flexibility, in fact this is not the case. In the play test, when the NVA attacked in accordance with their pre-planned orders the US player was hard pushed to hold them off, and the realisation that not only were the NVA working to their own agenda, but were also present in large numbers, came as a bit of a shock. It also meant that however the US player manoeuvred it seemed to have little effect on the enemy who just kept on going! Another point which should be played is the restrictions placed on the US fire support. These are applied as follows. I leave it up to the umpire whether to announce these before or after the start of the game. Obviously the NVA player will not know about these. Air strikes may not be used in any turn/initiative in which the US player calls in off-table artillery via the FO (this was standard practice in order to avoid the million to one chance of an aircraft being struck by an incoming shell). The reverse also applies, in that artillery may not be fired onto the playing area if air strikes are already in operation over the table during the turn, or if they are due to arrive later in the turn. This restriction does not apply to the company mortars however, who are deemed to be able to bang off rounds here and there in between the air strikes under the control of the weapons platoon commander and the mortar fire controller. The supply of mortar rounds however should be limited – resupply will obviously have to be by helicopter….. The Play test produced an excellent game. The US player attempted to manoeuvre out of the LZ, cross the stream and then turn west to approach hill 731 from the south (two platoons moved out, the third platoon was left to guard the LZ with the mortars. The NVA player elected to launch two company sized assaults, one each from the west and north. The dense terrain allowed the troops to practically bump into each other before making visual contact. The US dog teams helped here, as one of the dogs detected the NVA approach and alerted the point squad just in time to allow them to open fire first. During the course of the play test however both sides failed to accurately assess the enemy strength and the US troop’s “hump in the boonies” soon degenerated into a fighting withdrawal back to the LZ, desperately trying to evacuate their casualties in the process (the US player, to his credit, managed to bring out all of his casualties and left no-one behind!). Meanwhile, back on LZ Tusk the mortar platoon and the third rifle platoon fought their own battle, as they held off repeated NVA assaults. Fortunately for the US player, air support usually arrived at the crucial moments and a combination of Huey gunships and low flying Loaches kept the NVA pinned down under a hail of rocket and minigun/M-60 fire just outside the LZ perimeter, preventing a mass assault which would have probably over run the LZ. After a fierce battle of some five hours duration (game time – the game actually took about 4 hours to play) the NVA mustered for one last assault on the LZ and managed to break into the US position where they were stopped in a short but savage hand to hand struggle. At this point the NVA commander decided that his casualties did not justify any further attacks and therefore broke contact and withdrew. After the game the NVA players commented on how well the pre-programmed orders and attacks worked. By simply following their orders as instructed they actually felt more able to enjoy the game without worrying about making major decisions, safe in the knowledge that if anything went horribly wrong they could lay the blame on poor planning by the commander! Incidentally the final assault on the LZ very nearly succeeded – had the NVA won the close combats it would probably have resulted in a severe defeat for the US players. All in all a good game. The Crossfire system worked very well when translated to the Vietnam period, and we decided to develop the use of a separate system for issuing orders to the VC and NVA. If you want to borrow the DVD I have the whole movie.